CES could be proving somewhat disruptive to traditional truck shows, with truckmaker Paccar making a splash, in tandem with Toyota. Paccar is exhibiting three zero emission vehicles it says are designed for a range of customer applications, ‘including over-the-road goods transportation, port operations and urban distribution". 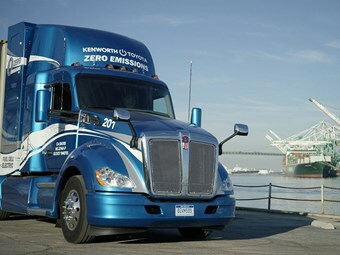 hydrogen fuel cell electric Kenworth T680 developed in collaboration with Toyota. "The Paccar Innovation Center in Silicon Valley, California enhances the company’s access to emerging technologies and talent from around the world," Paccar chief technology officer Kyle Quinn says. "CES is an outstanding forum to showcase Paccar’s advanced engineering leadership." In the US, Kenworth and Toyota are collaborating to develop 10 zero-emission Kenworth T680s powered by Toyota hydrogen fuel cell electric powertrains. "This is an excellent opportunity for Kenworth and Toyota to work together to both explore and drive the development of advanced zero emission technologies that will play a critical role in the commercial transportation of the future," Kenworth general manager and Paccar vice president Mike Dozier says. This collaboration is part of a US$41 million (A$58 million) Zero and Near-Zero Emissions Freight Facilities (ZANZEFF) grant preliminarily awarded by the California Air Resources Board (CARB), with the Port of Los Angeles as the prime applicant, the companies say. The grant monies are part of a US $82 million program that will put fuel-cell electric prime movers, hydrogen fuelling infrastructure, and zero emissions cargo handling equipment into operation in the ports and Los Angeles basin in 2020. "This is not just a science experiment, the goal is to make a difference in society. To remove pollution and improve the air quality in and around the Port of Los Angeles," Toyota Motor North America executive vice president Bob Carter says. The Kenworth T680s with the Toyota hydrogen fuel cell electric powertrains charge lithium-ion batteries to optimise performance as needed. Power management systems will apportion the electrical power from the fuel cells to the motors, batteries, and other components, such as electrified power steering and brake air compressors. The hydrogen fuel cell electric powered Kenworth T680s are to have a range of over 300 miles (450km) under normal haulage operating conditions. Toyota used last year’s CES to uveiled its e-Palette Concept Vehicle, a flexible automated platform with the flexibility to transport freight or people. The all-electric medium duty Model 220EV joins the previously announced Model 520EV and the Model 579EV in the Peterbilt electric vehicle lineup. Peterbilt aims to have more than 30 electric vehicles in operation by the end of the year, with customers representing the refuse, regional haul, and city delivery applications. "Peterbilt has been at the forefront of truck electrification, and adding the medium duty platform to our electric truck line-up was a natural evolution of our development plan. We will now have trucks in the three applications where electric powertrains may have a return on investment for our customers," Peterbilt GM Jason Skoog says. "Today, we have Model 520EV’s and Model 579EV’s on the road with customers, experiencing real-world environments and performing well. In addition to the customer field trials, Peterbilt is engaged in validation testing at the Paccar Technical Center (PTC) in Mount Vernon, Washington. "Data collected during customer trials and testing at PTC will be used to ensure that Peterbilt EV’s meet the same rigorous standards as our current trucks." The zero emission 220EV is powered by two TransPower battery packs combining for 148 kWh and a Meritor Blue-Horizon two-speed drive eAxle. It features a range of more than 100 miles (160km), a recharge time of "a few hours", and an argument for local pick-up and delivery operations.